Do you really have to give up your Pit Bull? Search your heart for the real reason why your dog can’t live with you anymore; be honest with yourself. Your answer will probably fall into one of two categories: People Problems or Dog Problems. Give Yourself Time! Understand that it may take you longer then an average (non-pet owning renter) to find an appropriate apartment or home for you and your dog. Plan ahead if you know when you’ll have to move and be persistent. Widen your search. Don’t just look online for apartments or rental homes, drive around the area you are hoping to move and look for rental signs. Take advantage of rental services that help tenants find apartments such as apartment locators and realtors. Ask friends, relatives and coworkers to keep an eye open for you. Many apartments are rented via word of mouth before they’re ever advertised in the papers. Put Together a Pet Resume. “No Pets” doesn’t always mean “no pets, period.” Offer to have a meet and greet so the landlord or apartment complex can meet your dog in person and see his/her awesome qualities. Put together a resume that highlights your dogs positives, including training, award certificates and health (spay/neuter). Also, highlight your best qualities as pet owners. Renter’s Insurance. Offer to buy a policy that will cover your dog. This helps protect the landlord’s biggest asset, his property and means of income. Pet Deposit. If you can, offer to pay a higher pet deposit in order to cover for any future damages that the landlord may believe could happen. Keep in mind that YOU may have to make some adjustments. A home that allows Pit Bulls might be in a different neighborhood than you’d prefer. It might be a few more miles from work. It might not be as luxurious as you’d like. It might cost a few dollars more, but your compromise means being able to keep your dog. 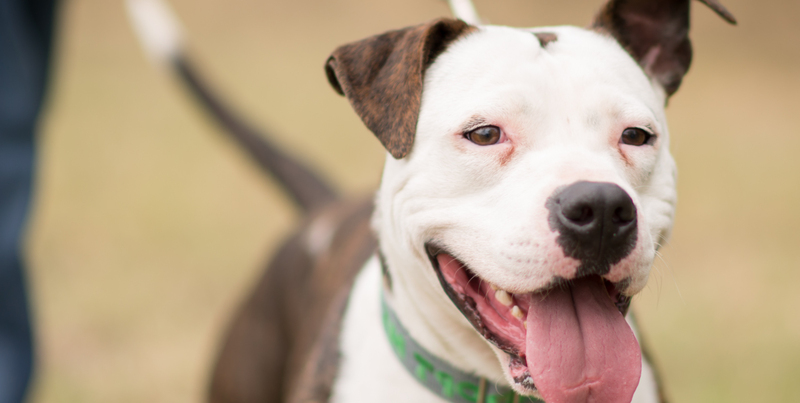 For Pit Bull friendly resources, including housing, insurance, apartment locators, realtors and more, make sure to visit the resources tab of our website. Introduction of a new little one can be stressful on the entire household, including the dog, BUT if introduced correctly, there shouldn’t be any problems that can’t be overcome with some guidance, training and early preparation. Having children grow up with dogs can create an incredibly special bond that nurtures compassion and kindness. In any situation, please remember to always supervise your child when they are around pets. It is your job to advocate for both your child and your pets. Behavioral issues can wreak havoc on the relationship between you and your canine companion. The stress of that bad behavior can become quite a load to bear. The truth…the best place for your badly behaved dog is in it’s home with you, being rehabilitated. Here’s the good news: most behavioral issues can be resolved or managed with dedication, consistency and professional training. Depending on the behavior, this may require a lot of time, dedication and consistency on your part, BUT at the end you’ll have a wonderful new relationship with your canine best friend! We’ve all had undesirable behavior from our pets at one point or another but helping them learn what to do is the first step before you call it quits. If your dog simply needs manners, try searching for local area obedience classes. Many times these types of classes help create structure and beginning expectations for behavior. Crate your dog when it is unsupervised, especially if it is not house trained (i.e. soils in the house or chews on items it shouldn’t). Commit to taking your dog on a 30-45 minute walk at least once a day. This will help in working off pent up energy and structured walks can help with building a bond between you and your dog. Create a consistent routine for your dog so that you can build expectations. Create a schedule that allows your dog to eat, take potty breaks and walk around the same time each day. If your dog is exhibiting dangerous behaviors either towards people, dogs or itself, please seek out professional assistance immediately. If you are dealing with a behavioral problem or pack dynamic issues, we advise you to reach out to the trainers that are currently involved in our rescue program as well as local area trainers. Love-A-Bull always suggest that each individual do their own research into specific trainers in order to find the one that would fit them best, their dog(s) and the situation at hand. Information on our rescue trainers can be found here. First, seek out the advice of a trainer that is an expert on aggression. Do your research on this trainer and make sure they have the credentials and/or experience to offer you sound, reasonable advice. If you choose to attempt to re-home your dog, you MUST be honest to future adopters about the behaviors your dog is currently exhibiting. If you are untruthful, you could be inviting a large array of lawsuits into your life. You would also be risking the safety of that adopter, his/her family and the community the dog will be moving to. We do not suggest taking your dog to a local animal shelter, even a “no kill”. Aggressive dogs rarely make it out of the shelters because of the liability their behavior causes to the community. If you feel that you have exhausted all other measures, humane euthanasia may be the most responsible choice. Even the smallest contribution goes a long way for us. We appreciate your kindness.